This chart shows the number of seats in the House of Representatives and U.S. Senate that the president's party won or lost during midterm elections dating back to Franklin D. Roosevelt. Americans are fickle. The political pendulum swings. At least the Senate stayed with the Republic rather than swinging to the donkeys. It will be interesting to see what the donkeys do. They can be responsible or they can be irresponsible. My guess (pessimistic) swings to the irresponsible, because that's what socialists are always inclined to do. And nothing will happen for two years. I know what the Donks in control of the congress have planned. A savage unrelenting series of personal attacks on the president through innuendo, phony "Kavanaugh style" accusations and inane investigations via "committees". Their main goal is impeachment (Wait till 1/2/2919) and if that fails a bottomless list of accusations hoping Trump will toss in the towel. America has changed subtly over the last 50 years. A well planned, clandestine invasion of the higher educational system seems to have achieved its goal. I'm happy I'm 76. A loss is a loss-now we'll get to watch how a party actually uses the power of a House majority to get what it wants. But being a silver lining guy, 44 Republican House members retired, most like the POS Ryan so that many open seats was a tough hurdle to get over. But they're gone and after 2 years of the Klown Parade we'll be treated to, maybe we can populate the House with a slew of solid conservatives in 2020. That outcome is devoutly to be wished! Still, I'm depressed. Now I don't have anyone at all representing me here in CA: Darryl Issa's seat went to a Dem, both my Senators are Dems, we've gone from a really bad Dem Governor to an even worse Communist Dem Governor in Gavin New-scum. Buckle your seat belts boys, it's going to be a rough ride for the next two years. I've got to get out of my native state, it's breaking my heart to watch it go down the drain, and it's sucking me down with it! 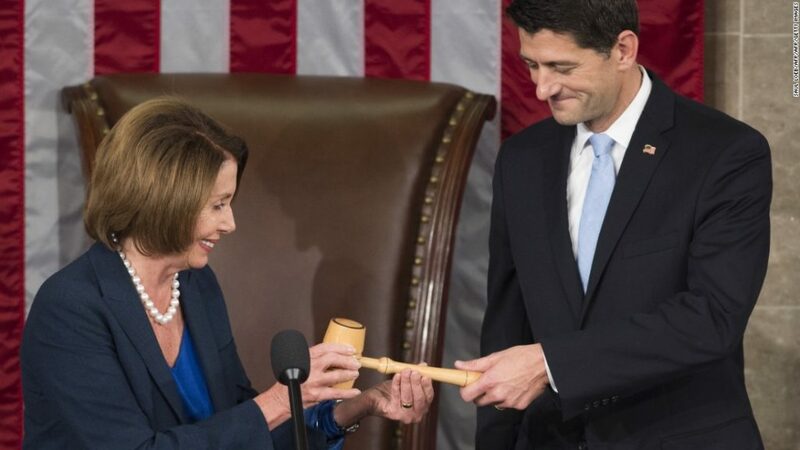 "Here you go, Nancy; it was too heavy for me anyway." The one good I see out of this is that we will have a honest enemy rather than a dishonest ally doing everything in his power to obstruct anything President Trump does.